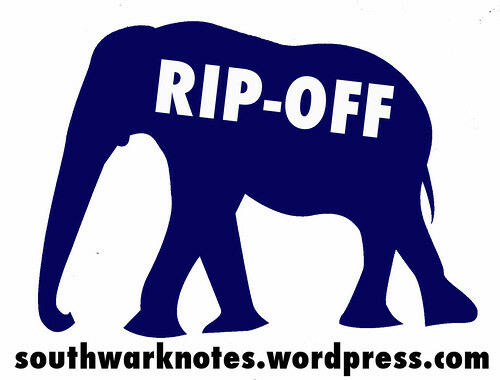 ARTISTS WORKING AGAINST GENTRIFICATION | Southwark Notes - whose regeneration? We can flesh this out later but right now (2016/2017) Boyle Heights Alliance Against Artwashing and Displacement is kicking it with amazing community work, investigation, coalition building and militancy in a part of LA that’s becoming an ‘arts quarter’ at the cost on the long-term local Latin@ neighbourhood. As part of this work they are demanding community accountability from artists and galleries who are arriving in the area. Such a grounding in making artists and galleries face their responsibilities re: gentrification and displacement is something that local groups in London could look at as an inspiration for their critical work here. Their ‘Short History of A Long Struggle‘ is fantastic piece of writing containing as it does an in-depth story of the Boyle Heights and its struggle to maintain itself in the face of poverty, police violence, gang cultures and demolition of public housing units. The fuss about creative cities in any case demonstrates how a renewed urge to colonize is currently manifesting itself on our own urban terrain. In the creative age, it is the Dutch city that is colonizing itself: ‘uncreative’ population groups are being moved out of familiar environments and new ‘creative’ groups of citizens are being imported with an eye to their serving as role models. 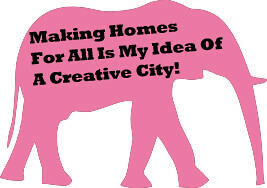 Each neighbourhood is seen as a potential source of creativity that must be exploited to the full. View Plea For An Uncreative City here. 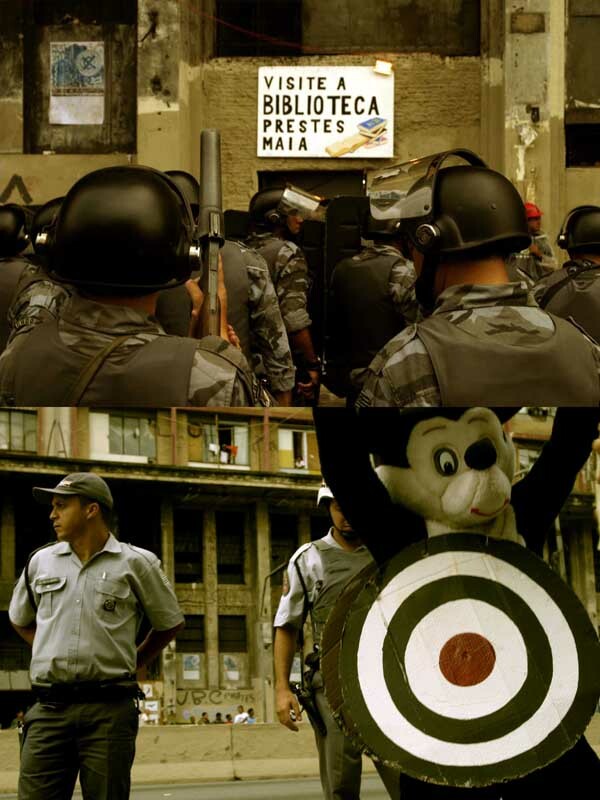 “The intention of this action is to show that artists are willing and able to place themselves and their work squarely in a context which shows solidarity with oppressed people, a recognition that mercantile and institutional structures oppress and distort artists’ lives and works, and a recognition that artists, living and working in depressed communities, are compradors in the revaluation of property and the “whitening” of neighborhoods. Organized by a committee of PADD (Political Art Documentation/Distribution), Not for Sale addressed the gentrification issue in the Lower East Side. 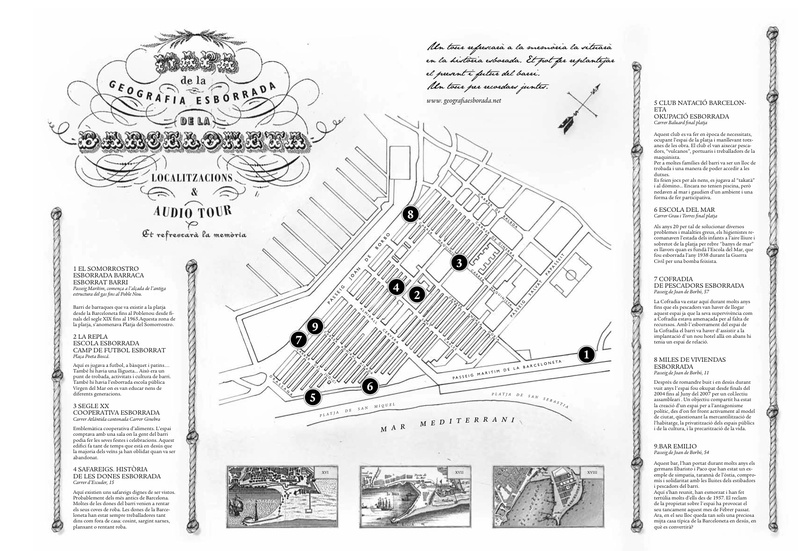 In order to reach a broader audience, the show was mounted in two locations, El Bohio, a former public school near Tompkins Square Park, and No Rio near Delancy Street. These locations were appropriate to the theme in that El Bohio is managed by CHARAS, a political and cultural organization that arose from the Latino population most affected by displacement; No Rio grew out of the Real Estate Show three years earlier. 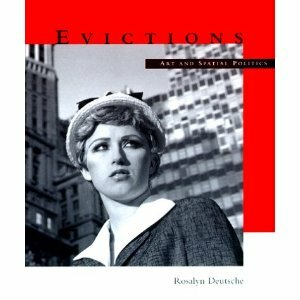 Sensitive to the role that art galleries play in the gentrification process, the Not For Sale committee repeated the theme a year later as a street poster “anti-exhibition” called Out of Place: Art for the Evicted. 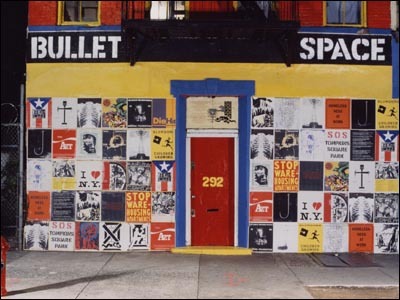 Bullet Space was located in a squatted building at 292 East Third Street – it was considered “the first homestead art space in NYC”. 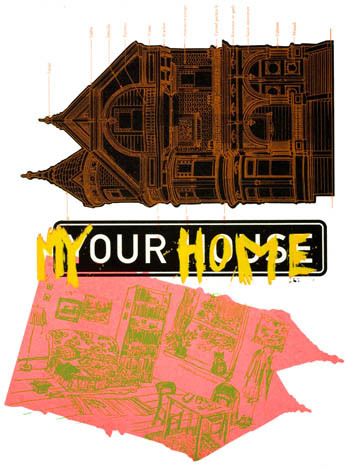 In 1996, it produced a series of 29 posters for flyposting on a range of pressing issues around New York and the Lower East Side. 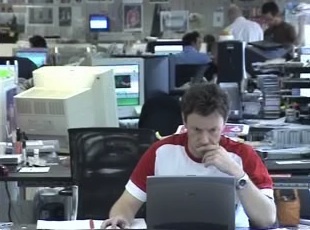 They also published this fantastic newspaper. 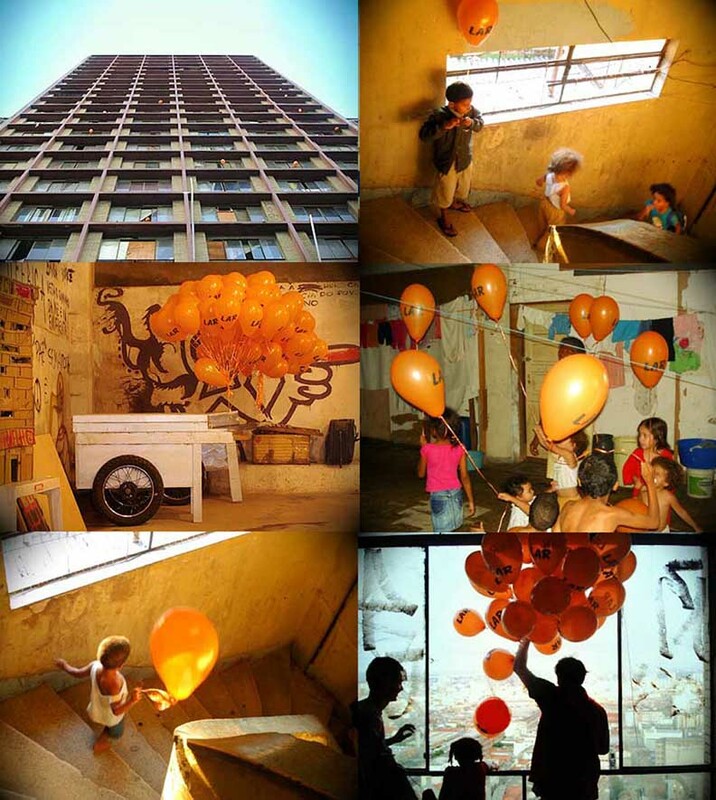 Also worth reading up on was the collaboration of artists and artist collectives with the Downtown Roofless Movement (Movimento Sem Teto do Centro / MSTC) of Sao Paulo in Brazil around the large occupation of the Prestes Maia building that existed as a safe home for 468 families from 2002 until eviction in 2007. It’s not that there were not problems, tensions and contradictions involved of course, but those artists who could make it through such a terrain and find collaboration and solidarity with the families really did produce an amazing series of moments together. See here for a good site with lots of pics and videos. It’s in Portuguese! 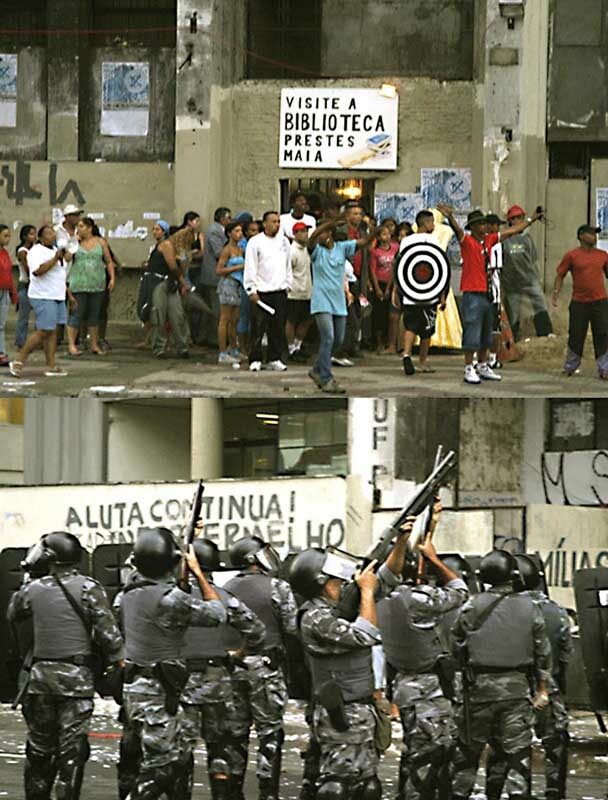 Worth reading on the tensions and the actual occupation and the art is ‘Art Collectives and the Prestes Maia Occupation in São Paulo‘ by Gavin Adams who was heavily involved there. Download here! 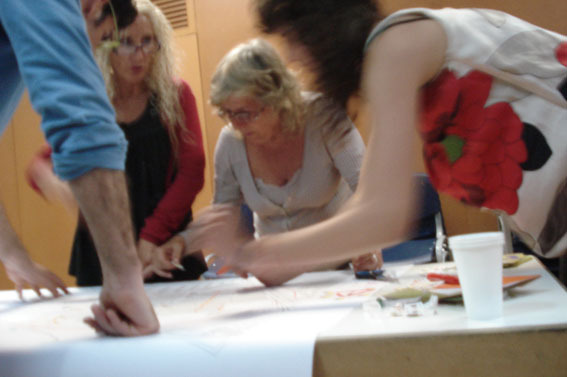 This key insight is made by the author in his post-script to the text: ‘The very central point seems to hold and persist: somehow artists tend to see themselves as specialists providing a service, and not as a social movement themselves, thus impoverishing contact with other social forces and resulting poetic potency. As we speak, activities collectively developed in Prestes Maia as free or ‘authorless’ are now signed pieces in the very shamans-turned-curators’ portfolios‘. 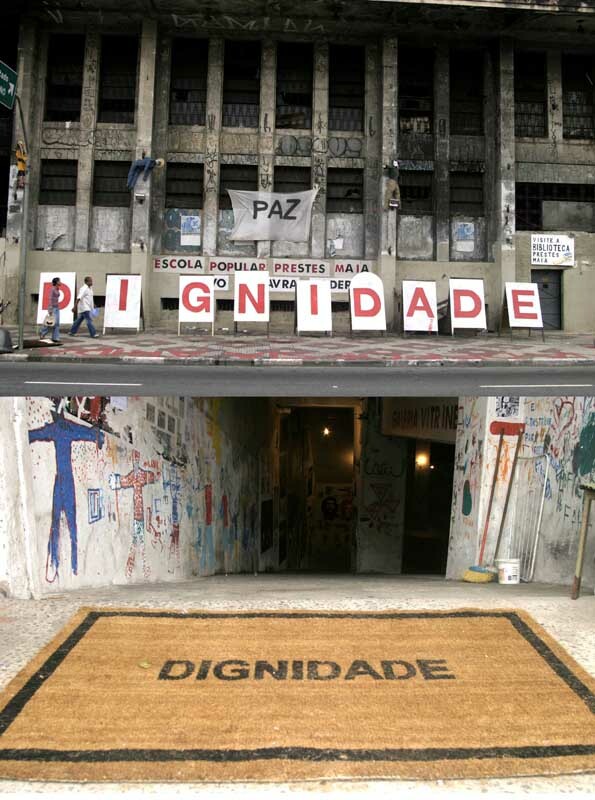 See also ‘The Prestes Maia Occupation: Creative Dissensus for Social Transformation‘ by Andre Mesquita here! 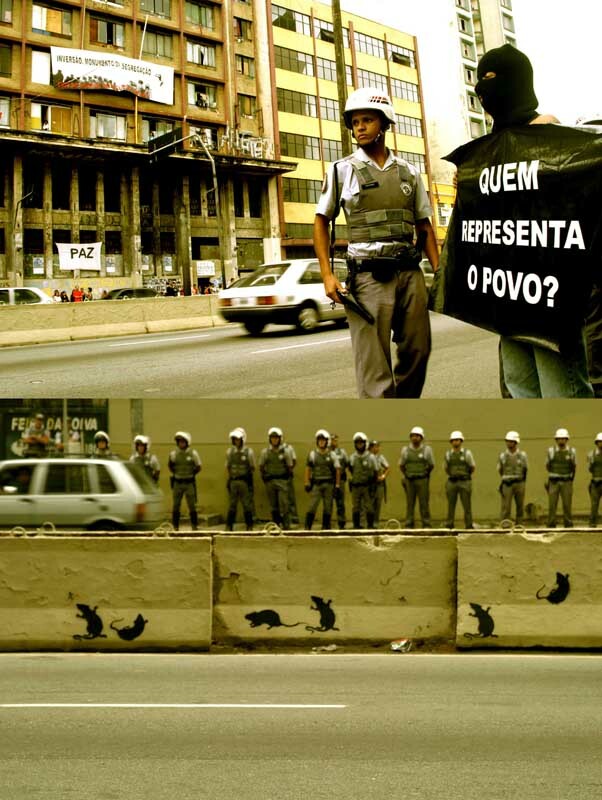 Note 2016: Sadly some people involved in some of the Prestes Maia artistic community have decided to have amnesia of the collective processes that were established in that time and have now individualised things as ‘their work’ with others curating works from Prestes Maia for major gentrifiying new art museums in Brazil. Yuk! 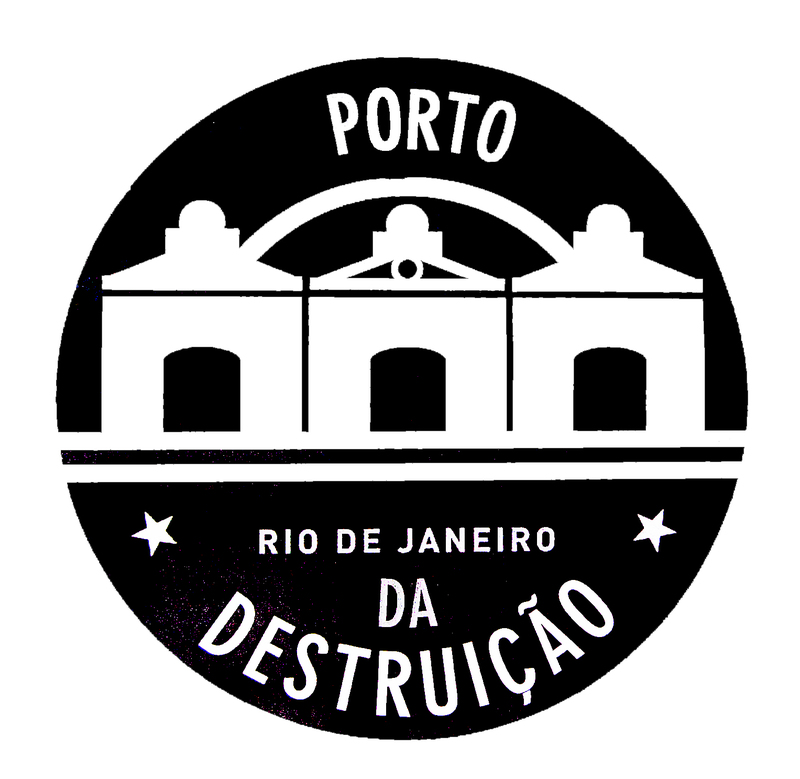 A great website working against the horrible plan to gentrify the old Docks area and Providencia favela in Rio with a multi-million pound PFI regeneration scheme. The scheme is called Porto Maravilha (Marvellous Port) but here the site retitles the scheme Porto Morte da Vida (Port Death of Life). 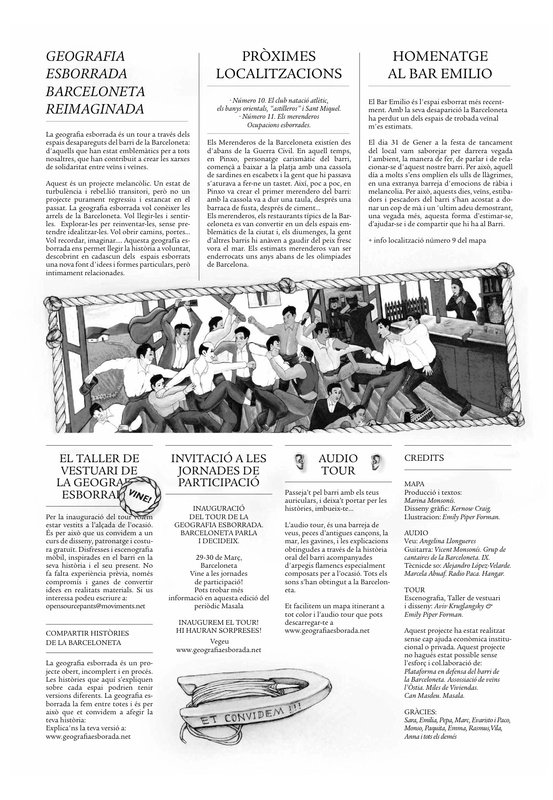 The site has maps and videos and texts that come from the artists working with local people to understand the issues on the ground. One of the other artistic strategies for visibility and defence of people’s basic dignity was to post large pictures of residents on the homes where they live alongside the horrendous SMH numbers that appear overnight without warning. The numbers signals your imminent eviction. 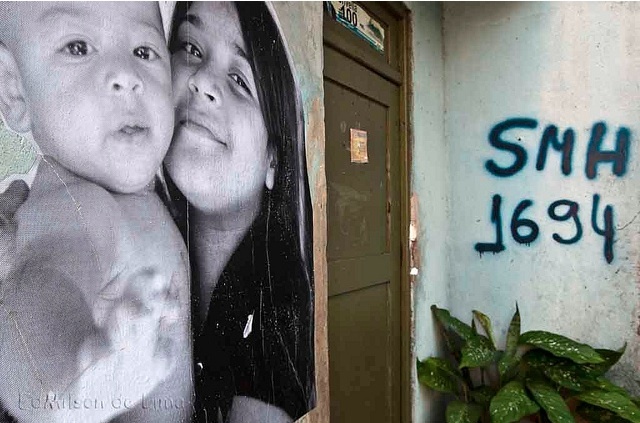 The SMH (Secretaria Municipal de Habitação) is the Government department responsible for eviction and displacement of residents in Rio’s many favelas, something that is more and more intense as the City hosts the World Cup in 2014 and The Olympics in 2016. 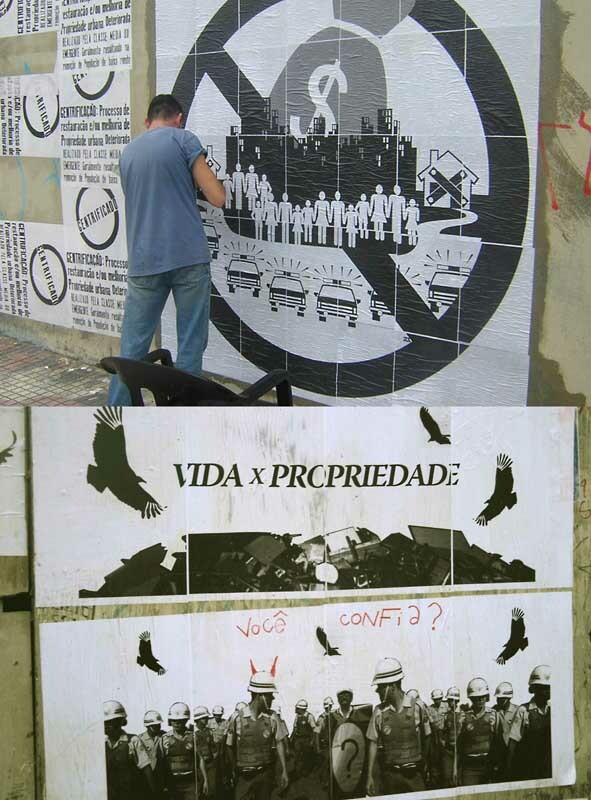 Poster made by the art group Poro from Belo Horizonte, Brazil, a duo who work with placing poetic images in various sites of the city. 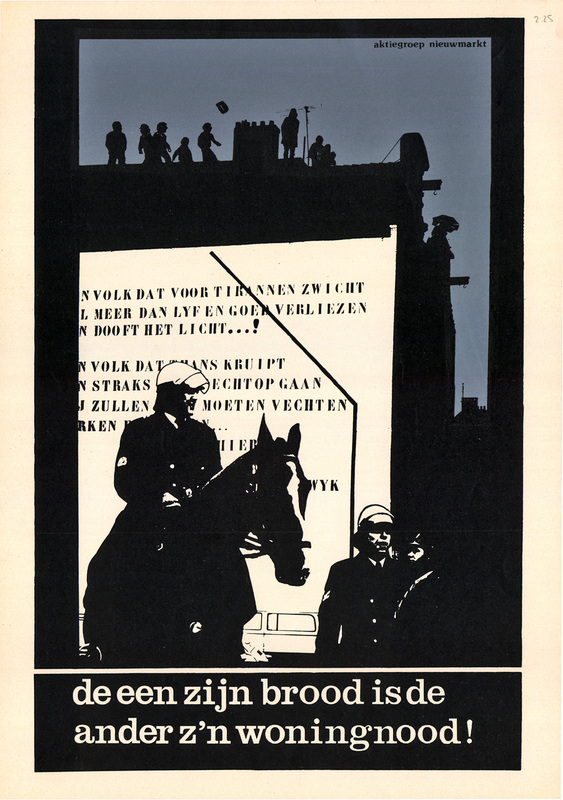 This poster is one of their more direct and critical works. 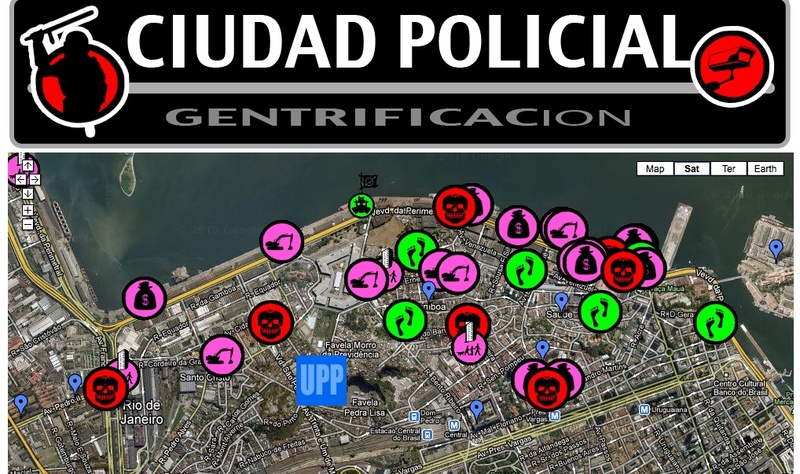 In this short video, you can see a collection of artists, activists and local people making a walk around their area Barceloneta in Barcelona mapping the different stages of gentrification of their area – eviction, disinvestment, regeneration, displacement etc. You get a great sense of how walking together to map the sites is a very powerful way for all those concerned to physically be in the place where the changes are occuring and to use this walk as a way to swap stories, histories and ideas for opposition as well as using imaginative and creative methods to mark the sites of gentrification too. 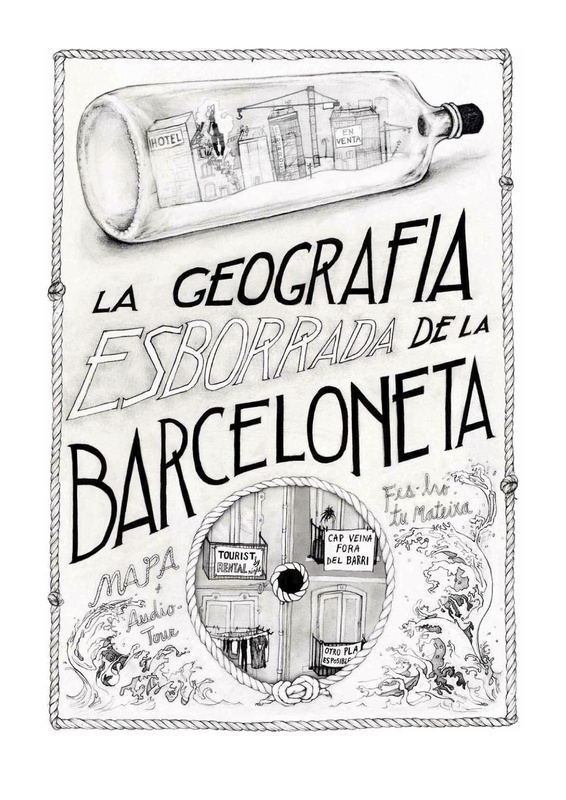 The map above (front and back) is also the result of a series of collective mapping workshops this time run between the Argentinian group Iconoclasistas and local people and neighbourhood groups in Barceloneta. 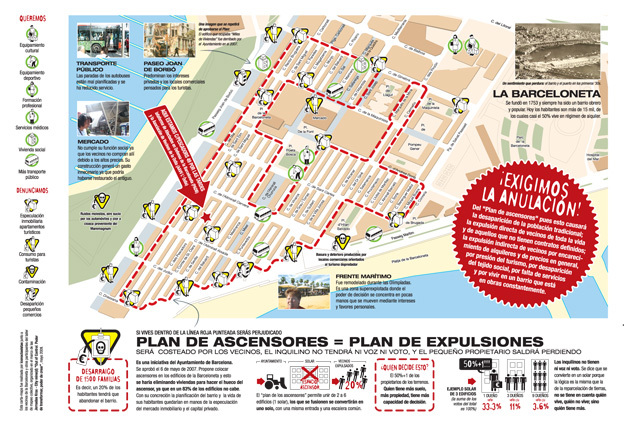 They were working to create ‘a communicative tool for inside and outside the neighborhood to bring attention to those trying to destroy it through the implementation of a “lift plan” that would see the destruction of their traditional homes in order to accomodate the whims on offer to tourists. All the graphics and text were obtained from four working meetings and formal discussions: “mapping in groups, sharing and discussion, presentation and discussion of content outline, and finally, proofreading and distribution of tasks with deadlines and printing times. This is the first time we organised a workshop featuring many days to plan a process of collective construction of knowledge and the results were evident in building bonds of trust and work, discussions and proposals, exchange and deepening of the tool objectives”. 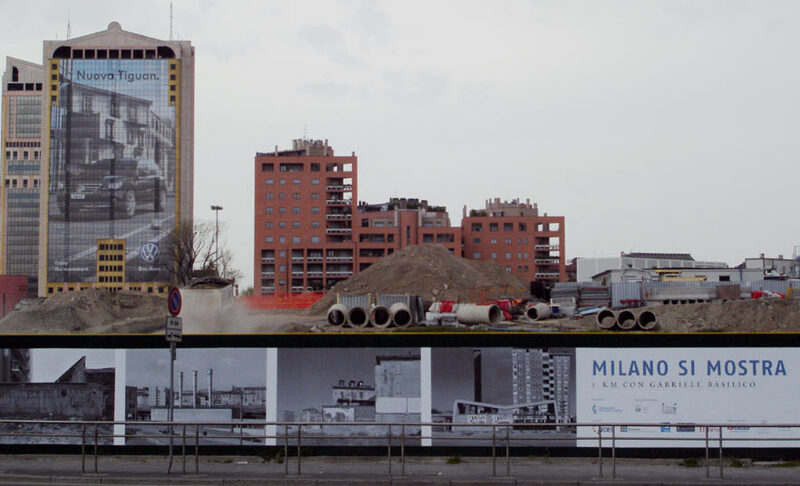 This arty film by Russian group Chto Delat presents a whole other way of looking at how giant and arrogant regeneration projects such as the absurd Gazprom Tower project are pushed through regardless of huge opposition and which networks of power guarantee a project’s survival and success. 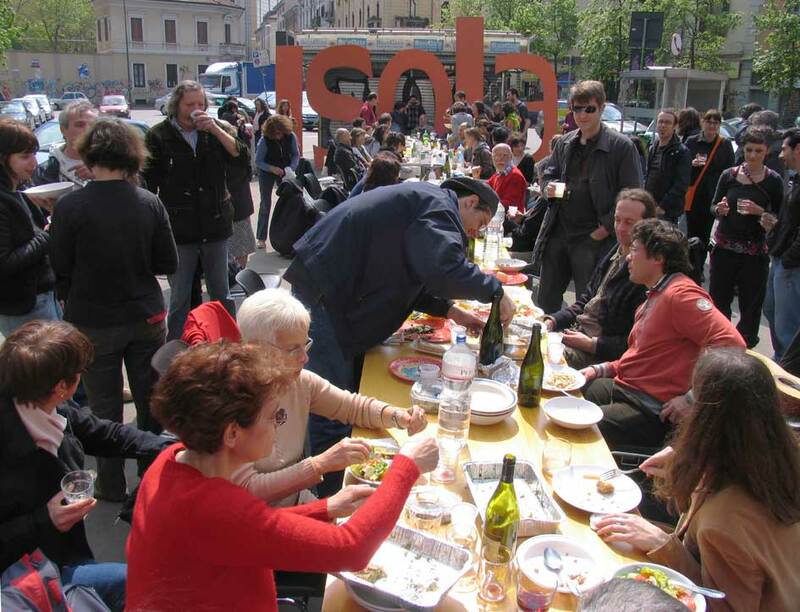 The name Isola Art Center comes from the Isola neighbourhood in Milan, where the Center has been operating since 2001 in various forms and sites – nomadic, occupation of a factory and now other again. 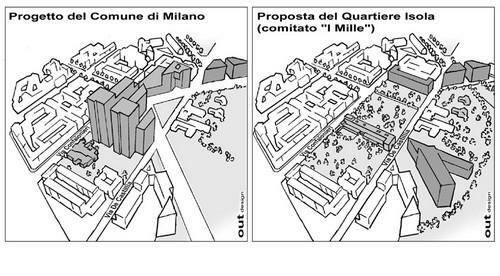 In it’s time, Isola was very vocal in it’s opposition to the regeneration and destruction of the Isola area of Milan. In Italian the name means ‘Island’ and this local area could be seen as a kind of island of a much more rooted and organic neighbourhood that the one that seeks to replace it – a series of offices, malls and a giant eco-tower. Once again, the Isola project was not without it’s internal and external artistic and political tensions. Such is the landscape for any social movement. 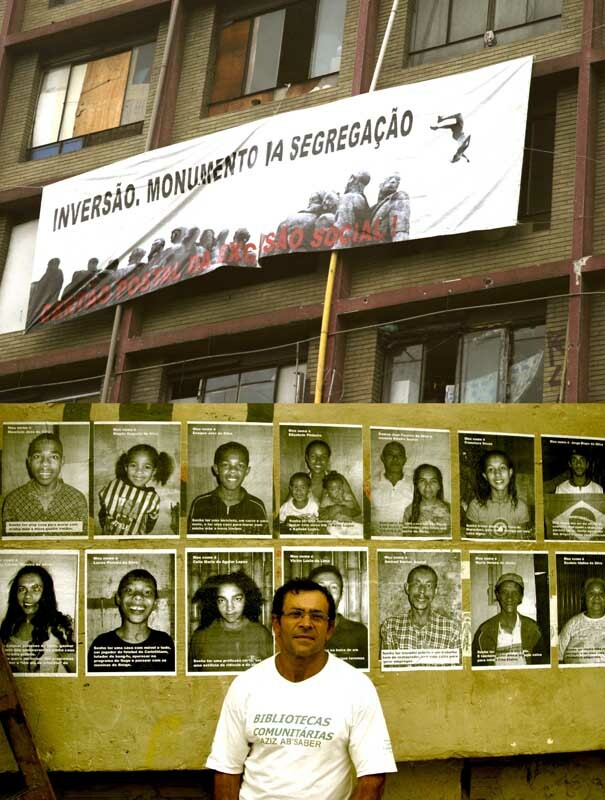 In the pics above you can see various events and histories – communal gatherings of Isola locals; alternative plans for the area; the use of local shops shutters to present artworks (after the eviction of the occupied factory); the eviction and demolition of Isola Art Centre and the new vast regeneration project taking place on the site. There is an interesting documentary online made up of 6 Chapters. You can watch it here. 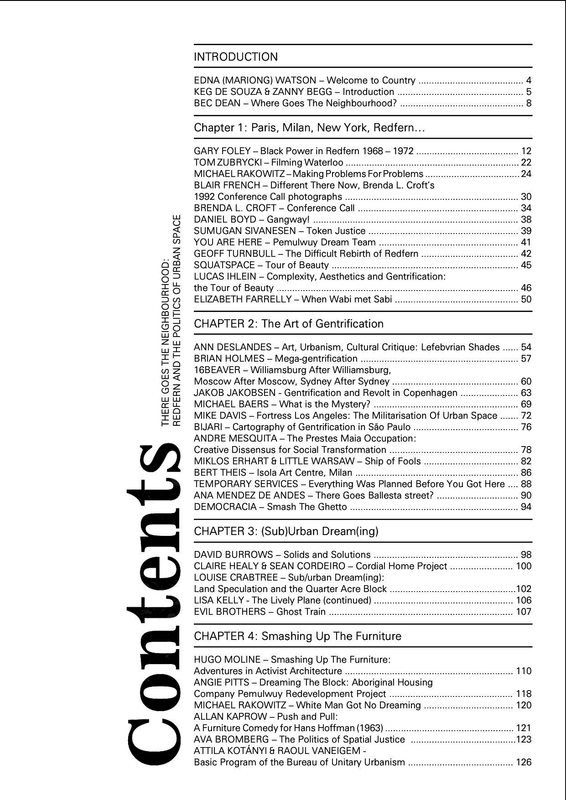 Chapter 5 has more stuff on Art and Politics of The City but it’s worth watching it all. In Pula, Croatia, a group of architects called The Pula Group began to work on the mapping of the city. ‘Red Plan is a plan for the city that is in an alarming (red) state. As a first step in the creation of such a plan, we need to locate the red or critical spots. 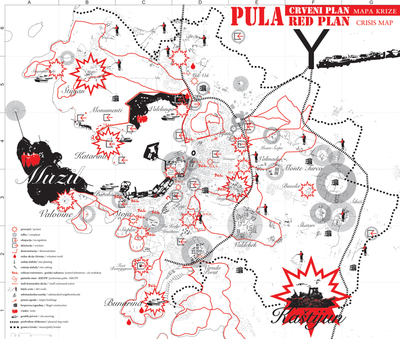 In order to do that, we created a “crisis map” of Pula: an image of the city in the age of late capitalism. The data used for the creation of this map was taken from the city section of the local daily newspaper Glas Istre in the year 2007. The events are categorized according to the type of activity (revolts, demonstrations, complaints, occupations, evictions, unauthorised construction, small communal actions, volunteer work. Apart from that, the map shows the points of potential future conflicts: abandoned buildings in the city, substandard settlements and dirt roads. 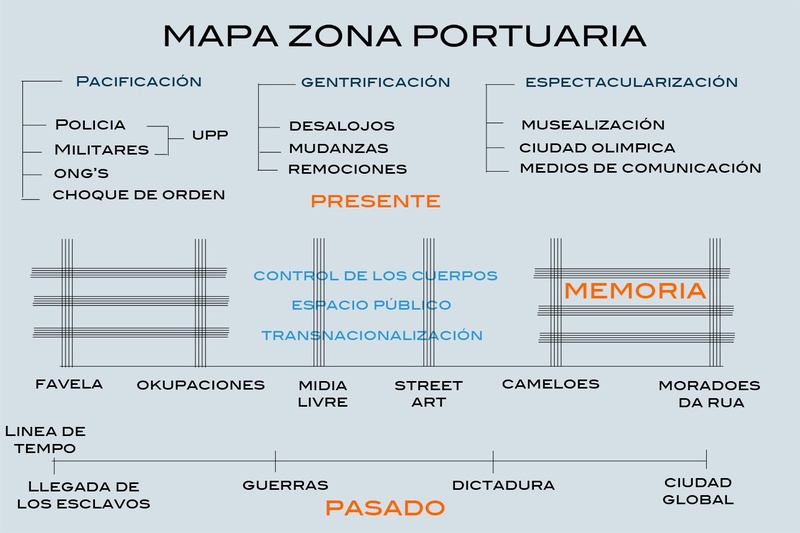 All the activities shown on the map should serve as a starting point for the development of clear and functional forms of urban intervention. 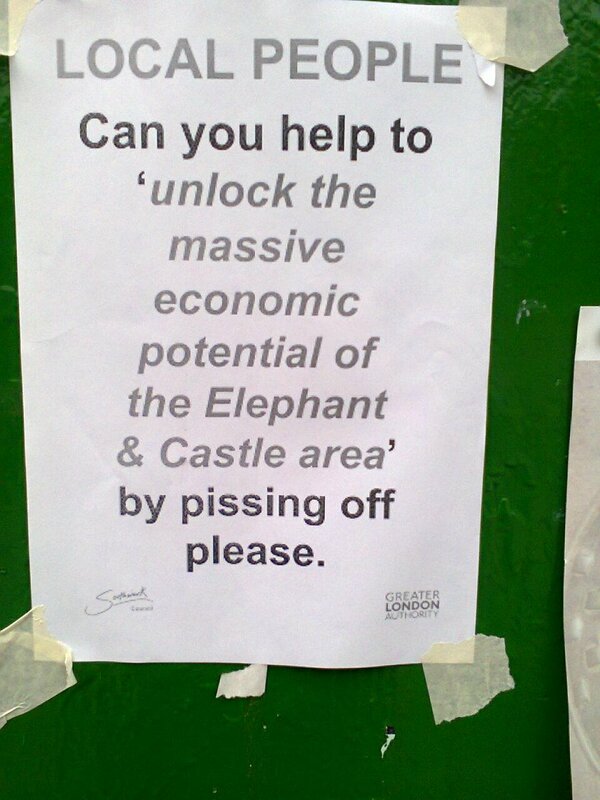 So far, these have been limited to discrete and temporary tactics aimed at changing the living conditions in the city. The goal of this map is to structure these actions and develop a strategy that would also change the living relations in the city‘. In 1965 and 1966 were to become the heydays of ‘Provo’ – a group of intellectuals, artists and students that aimed at erupting the authoritarian and conservative order by means of provocation. 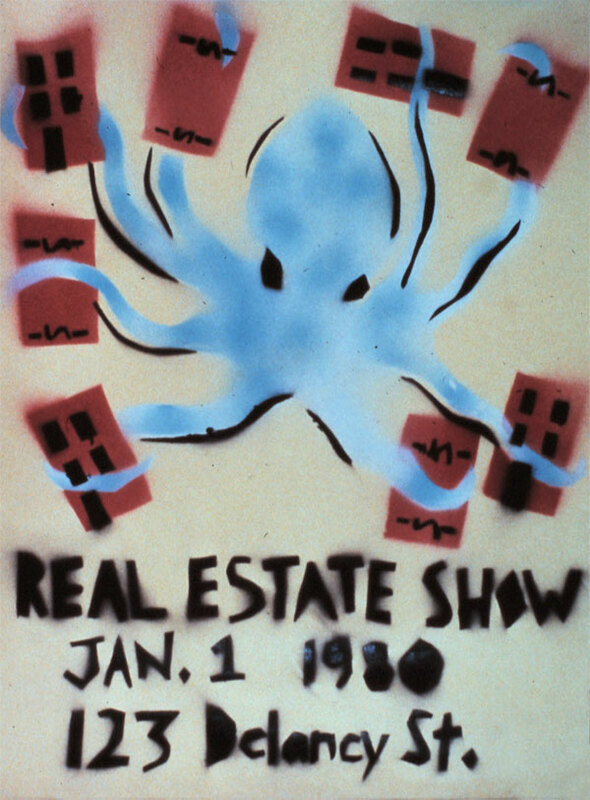 By the end of the revolutionary turmoil of the 1960’s, the Kabouter movement had arisen from the ashes of Provo, new groups had taken over these early squatting initiatives, and kraken had become a political act. 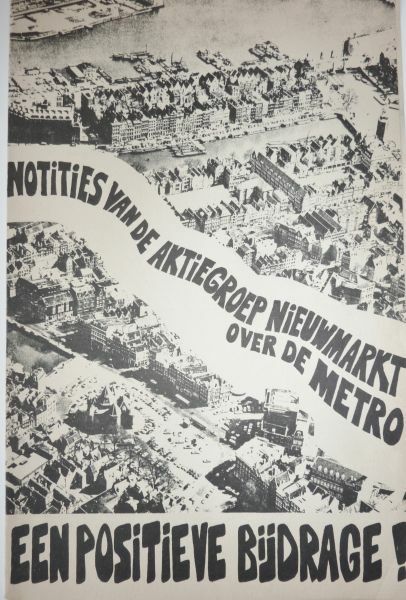 At this time, the Nieuwmarkt neighbourhood – semi-deserted and awaiting wholesale destruction in the wake of the development of a metro (subway) line – was to become the centre of a struggle that would give shape to the emergent squatting movement for years to come. The city council was planning to create a Central Business District (CBD) in the historical centre of Amsterdam, to be fed by a four-lane highway and an extensive metro-grid. Just as in other popular neighbourhoods, the residents – mostly lower middle- and working class – were being displaced into newly constructed suburban cores around the city. 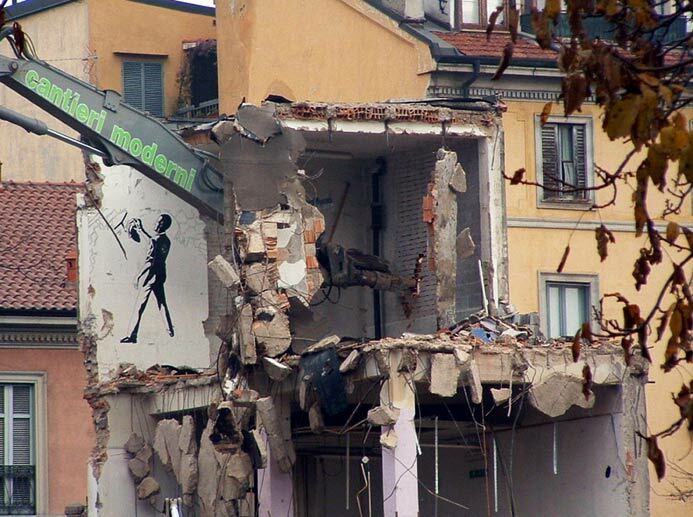 From 1968-1975, an intense neighbourhood campaign – in combination with the development of squatter infrastructure like a telephone alarm lists and sirens, pirate radio stations, neighbourhood bulletins, a printing press, a tool co-operative and a renovation fund – made it practically impossible for demolition workers to start the groundwork for the construction of the metro. 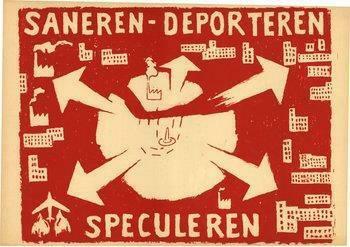 The squatter coordination group Aktiegroep Nieuwmarkt, in alliance with neighbourhood groups, instigated an intensive action and lobby campaign that forced the city government to it’s knees: although the metro line was eventually completed, the four-lane highway and the other metro lines were cancelled. 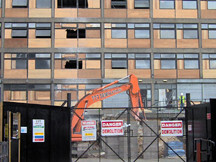 The CBD model was subsequently replaced by a more social formula to regenerate neighbourhoods for the resident population – by building predominantly social housing. 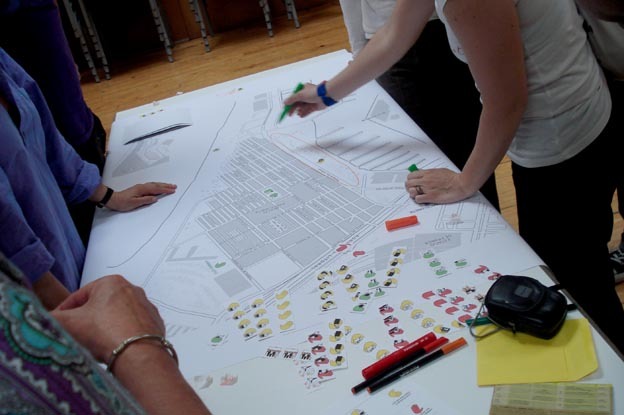 This process became the dominant model of urban planning in the Netherlands. Meanwhile, squatting spread like wildfire to the rest of the country where similar struggles ensued (for example, in Utrecht and Nijmegen). The San Francisco Print Collective was born in 2000 when dozens of printmakers met at the Mission Cultural Center and decided to respond to gentrification with art. 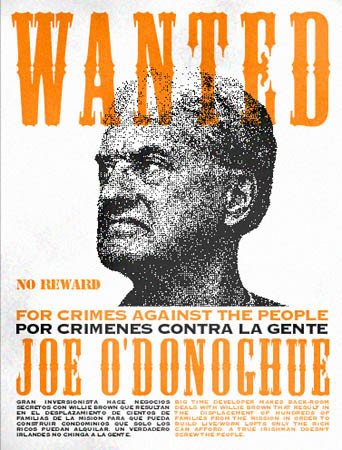 They printed posters together, gave copies to neighborhood groups and pasted their work on the streets of San Francisco. 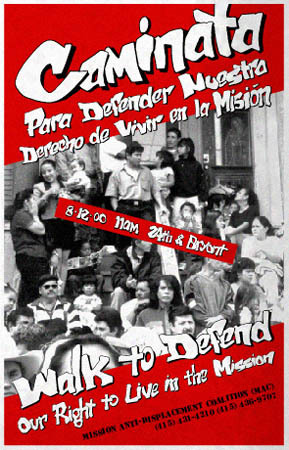 After this first project they joined the Mission Anti-displacement Coalition (MAC), a group of non-profits, small businesses and individuals working to stop the displacement of low-income people and immigrants from the Mission District. 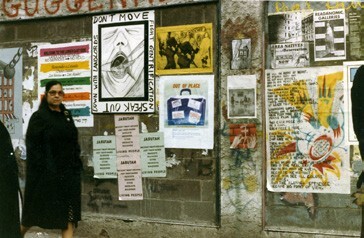 Leading a mass movement against gentrification, MAC carried out campaigns that made news headlines and changed city laws. The coalition lobbied for new legislation and zoning policies within local government but also staged sit-ins, building occupations and street demonstrations to wield political power on the streets. Tom Wetzel’s ‘San Francisco Space Wars‘ on the above collaboration is here. 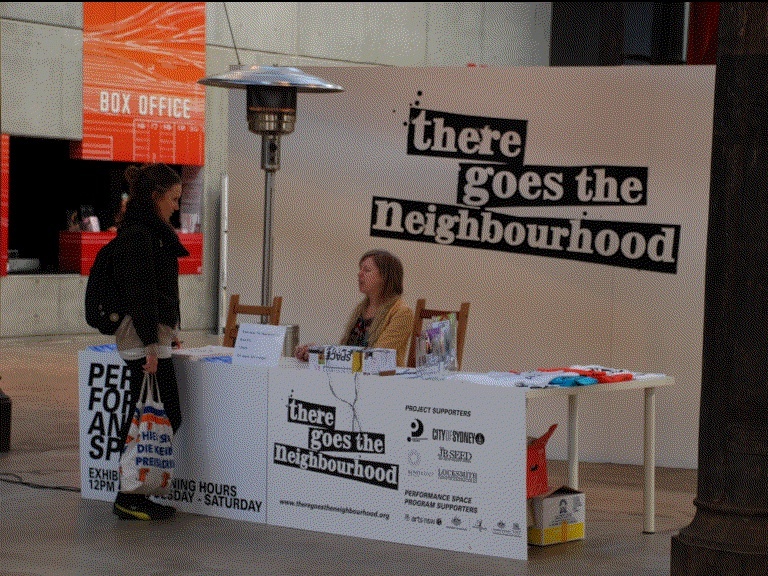 There Goes the Neighborhood was an exhibition, residency, discussion and publishing project in May 2009. 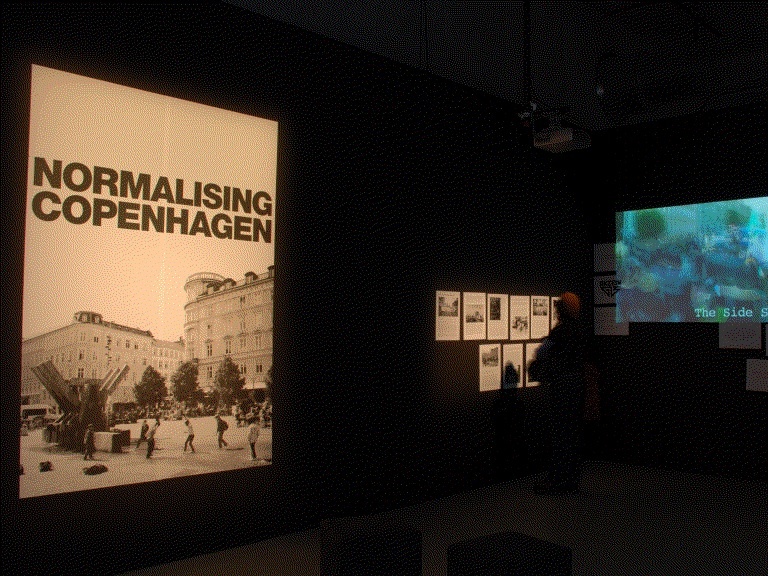 The central element of this project was an exploration of the politics of urban space. It explored the complex life of cities and how the phenomenon of gentrification is altering the relationship between democracy and demography around the world. 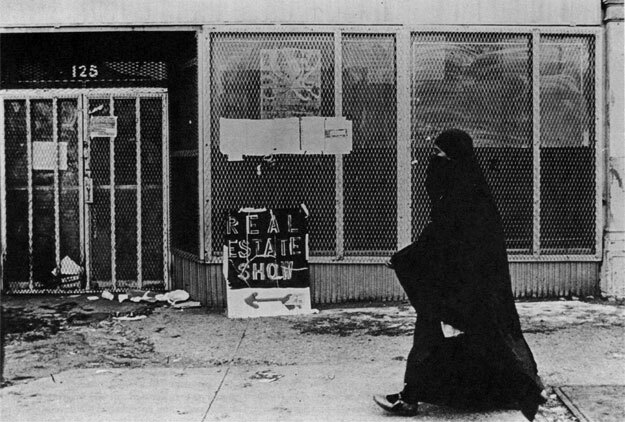 While urban change itself is not always a bad thing, gentrification often happens at an accelerated rate, out pricing the lower income and marginalized communities from the neighbourhood and dislocating them from their existing connections to urban space….The tussle over space is always one over the social relationships which are generated within the logic of place: revolving around people occupying, owning, seizing, developing, losing or transforming this space. 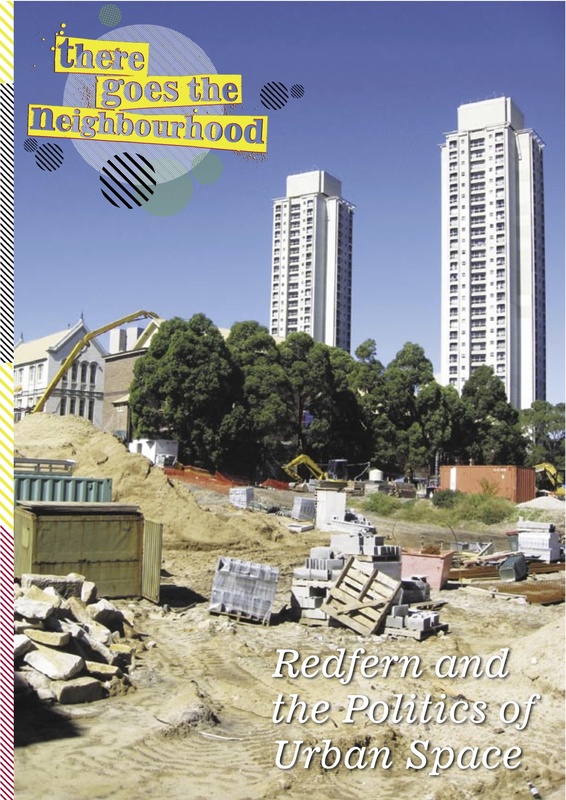 The project brought together a smallish group of artists who had worked in various artistic projects which had explored the relationship between community and space and invited them to develop these issues further in the contested local environment of Redfern. 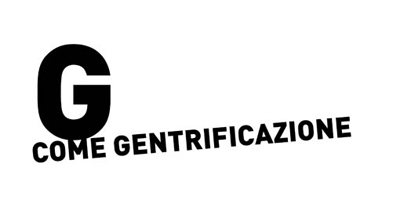 The project resulted in a really great book full of graphics, essays, photos and and ideas especially on art and gentrification which you can download here. The mega-businesses that are sponsoring the Istanbul Biennial are the same ones who are demolishing and gentrifying Istanbul via a huge ‘urban transformation’ programme. 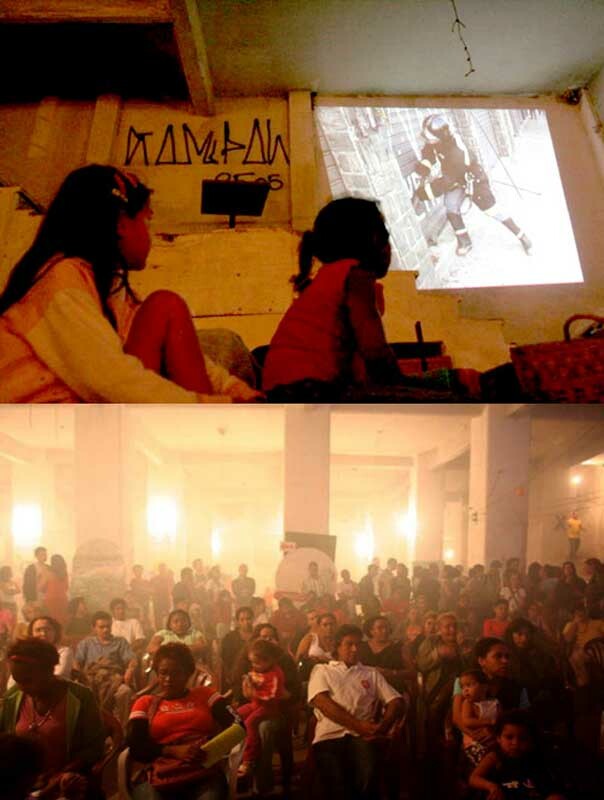 The video above shows the artists and activist coalition Public Resistance Platform// Kamusal Direniş Platformu occupying by performance one of the pre-Biennial ‘public’ art events. : “The Public Resistance Platform (Açıkalan Art Collective, Kamusal Sanat Laboratuvarı, Homur Mizah ve Karikatür Grubu, Student Collectives, ArtHack, Gündoğusu Sanat ve Düşün Topluluğu, Red Photography, Independent Artists, Independent University Students) stands against the biennial’s concept of Public Alchemy sponsored by the holdings who help the urban transformation projects happen, such as Eczacıbaşı and Koç. The protesters wore t-shirts that has the names of the districts under the threat of urban transformation written on each shirt, and lay on the floor in front of the speakers. The protesters lay blankets on themselves branded with the sponsors’ logos, and lay quietly on the floor, the performance ended with each of the protesters’ being carried out the rooms by the hotel security”. “The “Public Address” event, part of the 13th Istanbul Biennial public programme, was interrupted by the true owners of public opinion. Students, artists, local residents, in other words the true owners of this city, those who fight against urban renewal, or to give it its true name “opportunistic renewal”, along with the victims of these opportunistic handouts, interrupted the panel on the theme of “Public Address”, held as part of the Biennial events, an organisation that tries to legitimize these opportunistic handouts in the field of art through the “industry of culture”. While Fulya Erdemci was giving her opening speech, the protest was started by a group of protesters, who stood up and turned their backs to the speakers, wearing t-shirts that spelled out “BARBARLARI BEKLERKEN” (WAITING FOR THE BARBARIANS). While the press release was being read aloud protestors took to the stage and painted the phrase “MUM AM I A HUMAN?” on blank banners. Following the reading of the press release all protesters in the room turned to the audience and read aloud Cavafy’s poem “Waiting for the barbarians” in answer to Lale Müldür’s poem “Anne, ben barbar mıyım?” (Mum, am I a barbarian?). In response to Fulya Erdemci’s attempts to put an end to the protest with bourgeois politeness, the protesters continued the protest, shouting the slogan “Barbarians out!” As the protesters were so intent on disrupting the event, İKSV announced that the programme had been cancelled. As İKSV organisers left the room, representatives of neighbourhood associations spoke to remaining participants of the destruction and victimhood that they had suffered through urban renewal projects, which are run by the capitalist groups who also sponsor the Biennial. Meanwhile, the organisers from İKSV, who had originally handed over the microphone to show how democratic they are, turned down the sound and turned off the lights in the room in an attempt to stop the speeches by the local representatives. They then left the room“. 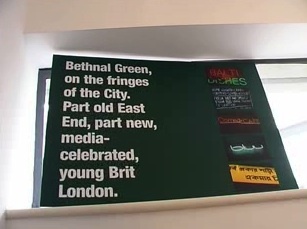 A project was set up in 2005 by local artists based in the Hoxton area, called the ‘Hoxton Story’. The project aimed at exploring Hoxton’s ‘mythical’ regeneration from the point of view of the people who live there, through a visual and oral montage of facts, fictions and verbatim testimony. It juxtaposed the perspectives of tenants, squatters, residents, council workers, community activists, artists, architects and developers. 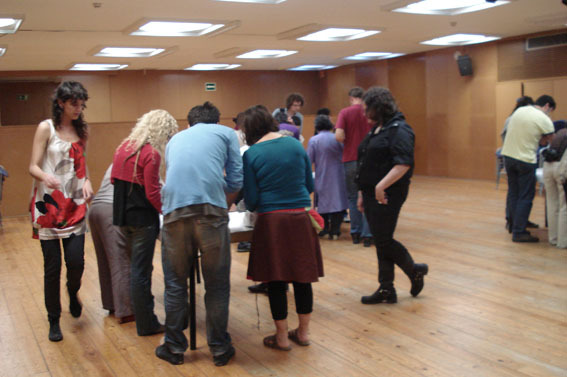 The project was realized by The Red Room, a radical theatre project founded in 1995 to address political, social and cultural issues through performing arts. The project illustrates the local engagement of a small number of ‘first generation’ Hoxton artists who settled in the neighbourhood. 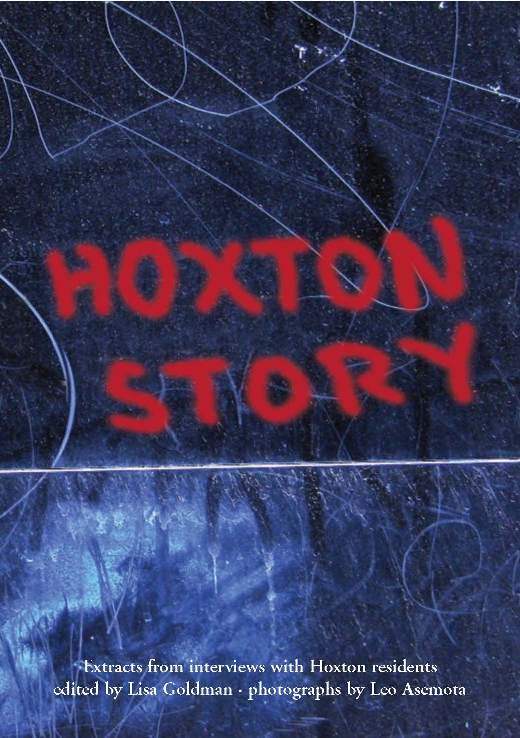 The Red Room’s director, Lisa Goldman, interviewed more than 30 local people to write the script for the ‘Hoxton Story’ and create an oral history audio- archive of residents’ voices about the changes in their neighbourhood. 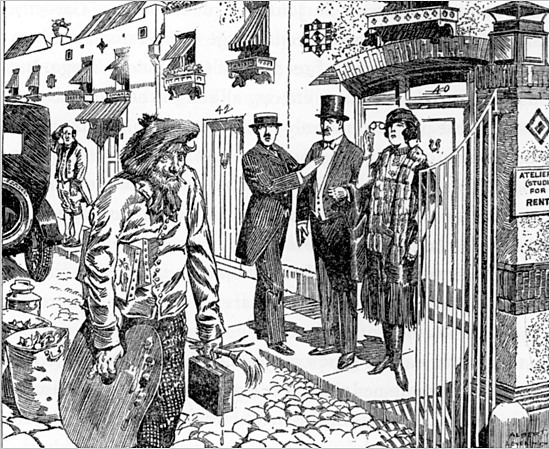 The project ended with a series of participatory theatre plays, or ‘intimate walkabout performances’, in which local residents and professional actors jointly took the audience in small groups through the streets of Hoxton – from a surviving music hall through the local market to council flats and shabby tower blocks, green spaces, a community centre and a trendy bar on Hoxton Square. At the end of the performance, the audience was carried in a hearse to attend the (metaphorical) funeral of Hoxton. The performance blended personal testimonies with fictional narratives and characters to draw the audience into an intimate, emotional vision of the contrasting perceptions of change in the area, asking who benefits (or not) from those changes. 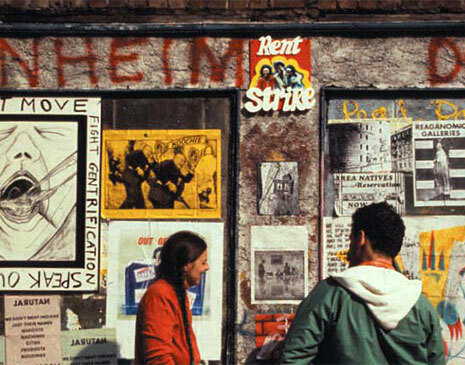 ‘is an open-ended urban research groups which has been documenting, theorising and acting against regeneration and gentrification in the East End since 2001. In our view, so-called regeneration in fact represents the spatial and social restructuring of the city in the interests of an elite minority. Privatisation of space, housing and services, the displacement of working class communities, and authoritarian social control coincide with rising homelessness and falling living conditions. In our view, so-called regeneration in fact represents the spatial and social restructuring of the city in the interests of an elite minority. Privatisation of space, housing and services, the displacement of working class communities, and authoritarian social control coincide with rising homelessness and falling living conditions“. 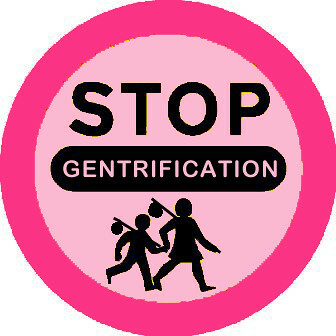 In the name of inner city rebirth and renewal, regeneration gives us state-sponsored gentrification and an intensified attack on the working class. It obscures its true objectives behind a dense and proliferating fog of quangos, agencies, partnerships, and funding bodies. Unaccountable and untransparent, they collectively dictate the new shape of the city through a pseudo-democratic discourse of consultation and participation”. They have two films to watch here! 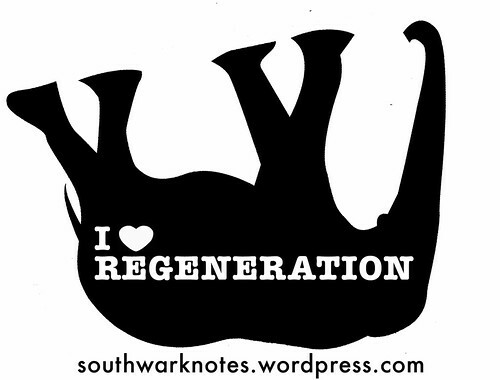 Do you know of anything good and imaginative and critical of regeneration that is going on in London? We haven’t come across much? Please send us links, graphics, reports etc.